Some movies try to do so many different things they can never complete anything. 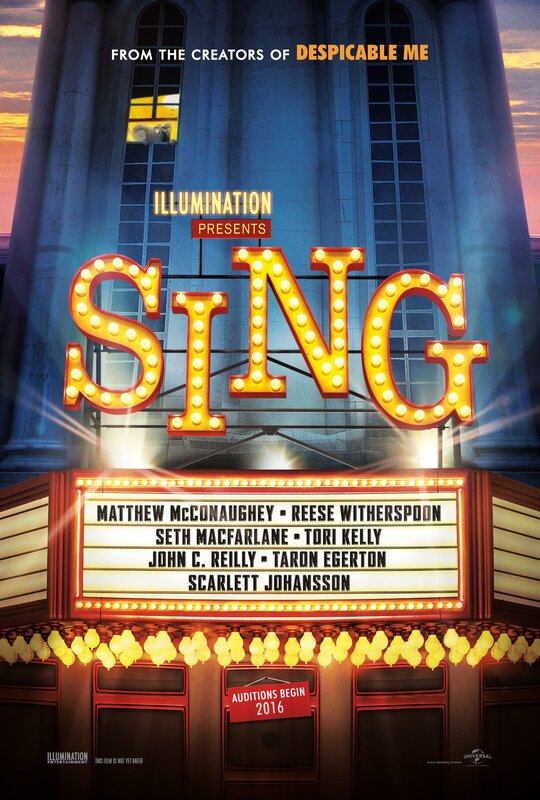 Today, that movie is Sing. It has never been a new concept to cram together an ensemble of A-List stars and a jukebox of hit songs. The unoriginality of it all is so blatant that even Sing has to joke about its own aped plot. This plot and this setting are not merely old; they are so oft-repeated that we have reached the point of tiredness. Buster Moon (Matthew McConaughey) is a koala bear. He lives in a world of funny animals who act like people. He owns a theater and he is very good at failing to put people in seats. While trying to court investment from the family of his friend Eddie (John C. Reilly), he comes up with the idea of a singing competition. The first problem is that he has no money for the prize. The successive problems in Sing stem from the increasingly large promises he makes to people he can’t pay. Despite the seeming potential of Sing to inform kids about managing their money, director Garth Jennings has taken a different angle. Sing includes clips from sixty-five songs, ranging from the Stormy Forties through to the New Tens. But this is better described as a handful of book-ending numbers with a large gulf in the middle. A couple solid but basic numbers start off the film. Jennifer Hudson’s rendition of Golden Slumbers recurs throughout the film as a leitmotif. For a film that marketed itself on the berth of musical numbers, the long second act will come as the purest of tortures. No song will complete itself without interruption; the stars themselves have aligned against Buster Moon. This lyrical limbo continues to force the audience of Sing through purgatory, until the final act ushers in the long-awaited singing contest. The audience will soon question what it is they’ve been waiting for. The last half-hour is a glut of passionless expression that is only of technical quality. At its best, they’re an attempt to go through the motions, get the paycheck from the studio, and leave the recording booth. At its worst, they’ve miscast an actor who can’t sing into a musical. The climax is artificial because the final numbers should be a step up from what we see before. Since nobody will sing anything until the end, the end is only as big as a paper tiger is scary. Sing is a musical without music, making false promises so audiences will arrive yet giving them no good reason to stay. Songs are cut too small to be seen; they are obscured by contrivances that fail to amuse. When they are finally forced to the surface, they simply fail to impress. In the vein of American Idol, the competition in Sing features a wide variety of characters with emotional backstories. Rosita (Reese Witherspoon) is a Stay-at-Home mom, who put aside her singing talents to take care of twenty-five piglets and a workaholic husband. Johnny (Taron Egerton) struggles to leave his father’s gang so he can become a singer. Ash (Scarlett Johansson) is an alternative rock porcupine trying to establish her own sound in the face of her domineering boyfriend. Meena (Tori Kelly) the elephant has a beautiful voice hampered by severe anxiety. 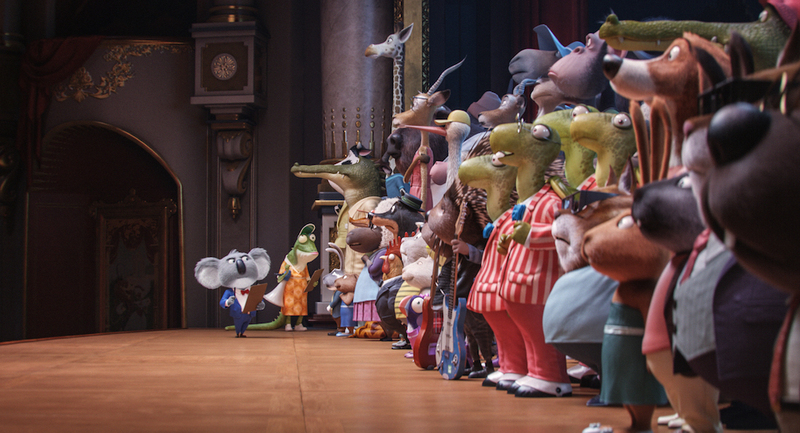 Mike (Seth MacFarlane) is a crooning mouse with an arrogance to match his talented baritone. All of these are workable premises that could drive a compelling story in the setting. They come with a protagonist the audience feels attached to. They also come with an array of supporting characters that could drive their plots along. The issue is that in a film just under two hours, there’s not enough time to cover every character in meaningful detail. Their development is lacking and they have no depth or texture to their personalities. The film does not display any more traits for any of the characters. If any of them overcome their personal life struggles, it has nothing to do with their efforts on-screen. Sing will simply declare things to have changed, and thus things have changed. If there is anything refreshing about Sing, it is the conscious effort to avoid drowning itself in pop culture references. Keeping the music and the culture timeless will help Sing age better than most of its fellow graduating class. Yet the longer it stays with the public, the worse the competition will batter it down. If you want a movie about a world of funny animals, rent Zootopia. If you want a musical-comedy safe for your kids, take them to Moana. If you want to hear Seth MacFarlane dust off some Big Band music, buy his album. But if you want a new or interesting take on any of the above, there’s nothing for you to find in Sing.